A 66-year-old female presents with severe flexion contracture following posterior-stabilized TKA at another facility. Physical therapy and MUA have been unsuccessful in restoring ROM. A complicated revision procedure is the next option. Stiffness following total knee arthroplasty (TKA) is a well-known complication of the procedure. Physical therapy (PT) following TKA is often recommended to prevent stiffness. 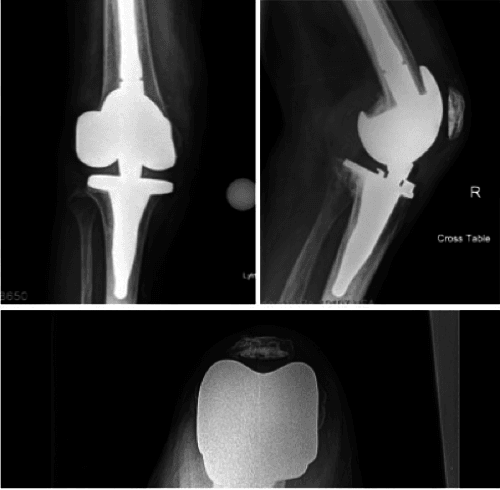 In this report, we present a unique case of a patient with a severe flexion contracture following posterior-stabilized TKA. She initially underwent postoperative PT and ultimately needed MUA. This restored full extension for a time, but subsequently she regressed and developed a flexion contracture of greater than 90°. Ultimately, she presented with a posteriorly dislocated TKA. A 66-year-old healthy female was referred for evaluation of a recalcitrant flexion contracture after undergoing a right TKA at another hospital. She presented in a wheelchair, stating that she had not been able to ambulate for at least a month. Eight months prior to presentation, she had undergone an uneventful right TKA for osteoarthritis. At that time, the patient was working as a teacher and was fully ambulatory, with pain secondary to her osteoarthritis. The patient was seen 2 weeks postoperatively and complained of pain as well as nausea due to her pain medications. According to the surgeon’s record, she had “good” range-of-motion (ROM) at this time. One month postoperatively, the patient was frustrated with her pain control and developed difficulty with knee extension. At 6 weeks postoperatively, her knee ROM was 15° to 130°. The patient also complained of falling and continued pain. Serum inflammatory markers for infection were negative. After 2 months, the patient had a 15° flexion contracture and problems with balance. She was then admitted to an inpatient rehabilitation facility and a joint active system (JAS) brace was applied. Three months postoperatively, the patient sustained a left wrist fracture after falling while she was ambulating with a walker. She underwent open reduction internal fixation (ORIF) of the fracture and was discharged back to the inpatient rehabilitation facility. Her knee contracture progressed to over 30° and she underwent a MUA. She achieved full extension 4 months after the initial TKA and the JAS brace was again applied. Two weeks after the MUA, the patient was seen in the office with a recurrent contracture and a broken brace. She then underwent a second MUA and cast application with return of ROM from 0° to 130°. Two weeks later, the cast was removed due to pain issues. Her flexion contracture recurred to 40° 2 weeks after the cast was removed. Six months after her index TKA, the patient presented after feeling a pop in her knee. She had lateral and posterior pain. Her patella dislocated laterally with hyperflexion, and her flexion contracture had progressed. She was sent for neurological evaluation, which was negative for central nervous system pathology. At 7 months after surgery, her ROM was 90° to 130° with pain. She was referred to the senior author for further evaluation and treatment. Figure 1 shows posterior dislocation of the right knee following knee replacement, with no evidence of component loosening, as well as subluxation of the patella. Figure 1. Radiographs of patient’s right knee at presentation. Due to the presence of subtle neurologic findings on examination and the history of cranial cavernous hemangioma, the patient was referred for a second neurologic opinion. Once again, central nervous system pathology was excluded. The patient was offered revision TKA for the dislocated TKA. An abbreviated description of the procedure follows. A medial parapatellar approach was used. The knee was reduced and the post was found to be intact. No overt evidence of infection seen. The tibial and femoral components were removed with a minimal amount of bone loss. The patellar component was assessed and noted to be stable, not significantly damaged, and well positioned; therefore, it was retained. With the tibial and femoral components removed, the knee was still unable to be extended past 50° of extension. Both the medial and lateral collateral ligaments were attenuated secondary to the subacute dislocation. The semimembranosus was released and the gastrocnemius heads were released. Thorough posterior capsular release off the femur, as well as an iliotibial band release was performed. The knee was still unable to be fully extended and, therefore, tenotomies of the biceps femoris and semitendinosis tendons were performed through 2 separate incisions. Once the tenotomies were performed, the knee could be brought out to full extension. Cemented rotating hinge TKA components were utilized (Figure 2). The knee was stable in extension and flexion and the patella tracked well. Final intraoperative ROM was from 0 to 130°. Figure 2. Radiographs after revision surgery. The knee was placed in a hinged brace in 20°of flexion to reduce tension on the neurovascular structures. Over the next 2 days, it was brought to full extension. 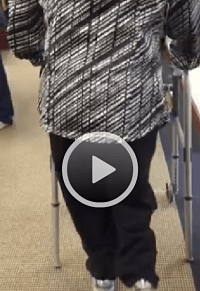 At 2 months follow-up, the patient was ambulatory with a walker, had full ROM and was living at home (Videos 1-2). She was pain free and had full neurologic function. Video 1. Postoperative range of motion in the office. Video 2. Postoperative ambulation in the office. Most patients who do not respond to conservative measures can be treated with MUA early (prior to 12 weeks postoperatively). Others may require revision surgery. In this case report, we present a patient who failed non-surgical treatments and required complicated revision surgery, including releases of tendinous and capsular structures. She is being followed very closely to evaluate for recurrence of her symptoms. Early PT may reduce the incidence of arthrofibrosis after TKA. Revision surgery should be considered only after failure of PT and MUA or in severe cases in which dislocation of the prosthesis has occurred. Revision surgery involving sequential release of ligamentous, tendinous, and capsular structures resulted in an early satisfactory outcome for this patient. Peter Pyrko, MD, PhD; Antonia F. Chen, MD, MBA; and Matthew S. Austin, MD, are from The Rothman Institute, Philadelphia, Pennsylvania. Seyler TM, Marker DR, Bhave A, et al. 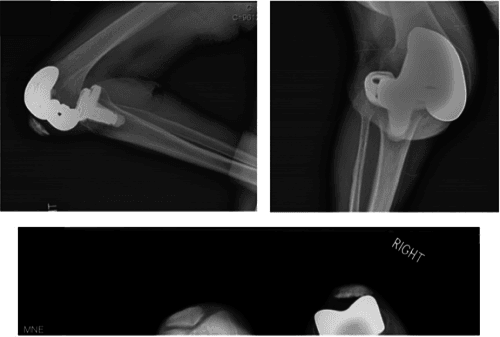 Functional problems and arthrofibrosis following total knee arthroplasty. The Journal of Bone and Joint Surgery American volume 2007; 89 Suppl 3: 59-69. Koh IJ, Chang CB, Kang YG, Seong SC, Kim TK. Incidence, predictors, and effects of residual flexion contracture on clinical outcomes of total knee arthroplasty. The Journal of Arthroplasty 2013; 28(4): 585-90. Scuderi GR, Kochhar T. Management of flexion contracture in total knee arthroplasty. The Journal of Arthroplasty 2007; 22(4 Suppl 1): 20-4. Mehta S, Vankleunen JP, Booth RE, Lotke PA, Lonner JH. Total knee arthroplasty in patients with Parkinson’s disease: impact of early postoperative neurologic intervention. American Journal of Orthopedics 2008; 37(10): 513-6.